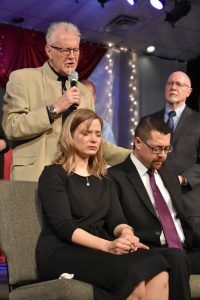 The ordination service at Life Church of Kirksville on March 4, 2018, was such a special, joyous time. Sandwiched between Jonrey and Alicia Pino’s wedding and Heartland’s missions conference, the Sunday service also served as a family reunion of sorts. The building was packed with homefolks and dear friends from across the country and around the globe. The joy of the day was twofold: setting in a proven elder, Jeremy Pingel, to head up the leadership team, in addition to receiving Andrew Fajkus onto the team as a new elder. A jubilant time of praise evidenced the faith and expectation stirring in our hearts, not only for the service that morning, but for the new season ahead and all that God has in store for us and our community. A new song by Jon Shipman gave voice to the excitement of the day: “Let there be light in this city, let there be joy to all who hear, that the King of all creation has come to reign!” The establishment of God’s government and reign on the earth truly gives His people reason to rejoice. The prophetic atmosphere was strong as the apostolic and local teams and church body ministered to Jeremy and Ruth. 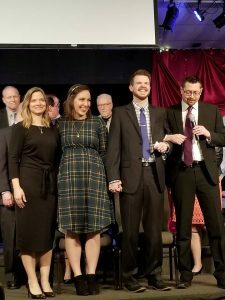 While numerous diverse words and exhortations were given, a significant theme for the church was the receiving, surrounding, and supporting of the whole family as they step into this new role. During the time of prophecy over Andrew and Amy, the church was encouraged by the raising up of “Samuels” who have been raised in God’s house in order to serve as leaders in His kingdom. At the beginning of 2018, David Bost shared a vision with the church that encapsulates the significance of the new day God is ushering us into. He saw a book, and it was not only of a new page being turned or a new chapter being started; a whole new book was being opened, as the old closed. This year is the 35th anniversary since the planting of the church in Kirksville, and we are filled with courage as we consider the new ground to be taken in the land and new stories to be written in the book in the next 35 years.